The UCP has removed Randy Kerr as its candidate for the riding of Calgary-Beddington, saying Kerr wasn't "forthcoming" about his financial contribution to former UCP leadership candidate Jeff Callaway's campaign. "In the last 48 hours, new information has come to our attention indicating Mr. Kerr was not forthright in responding to the party's inquiries regarding his financial contribution to the Jeff Callaway leadership campaign," said UCP executive director Janice Harrington in an emailed statement Wednesday evening. "To be clear, the party is not making any allegation against Mr. Kerr regarding the legitimacy of his contribution to the Callaway leadership, nor against Mr. Callaway or his campaign. This is not the party's role to judge, and the party does not in any way oversee financial contributions to leadership campaigns," said Harrington. "However, it is our conclusion that Mr. Kerr was not sufficiently forthcoming with the party's earlier inquiries, and for that, he has been removed as a candidate." Kerr donated $4,000 in cash to Callaway's leadership campaign, according to financial disclosure documents. CBC News has reached out to Kerr for a response. A message congratulating Kerr on his nomination win had been deleted from the UCP website as of Wednesday evening. Kerr's Twitter account had been taken down as well. He was a co-campaign manager, along with Cameron Davies, for Callaway in 2017. Alberta's election commissioner is investigating allegations of irregular financial contributions made to Callaway's campaign during the 2017 UCP leadership contest. Davies was fined $15,000 by Alberta's election commissioner for obstruction of an investigation last week. And contributor Karen Brown was fined $3,500 for contributing the same amount to Callaway's campaign, "with funds given or furnished by another person," according to the commissioner's website. Davies' lawyer has told CBC News he plans to appeal the fines, and said his client denies the allegations. The UCP said it's provided the "new information" it obtained regarding Kerr's financial contribution to Callaway's campaign to the election commissioner's office, and given that the matter is now before the commissioner the party will not be providing further comment. Harrington said the matter does not in any way involve the UCP, Kenney, or Kenney's leadership campaign. 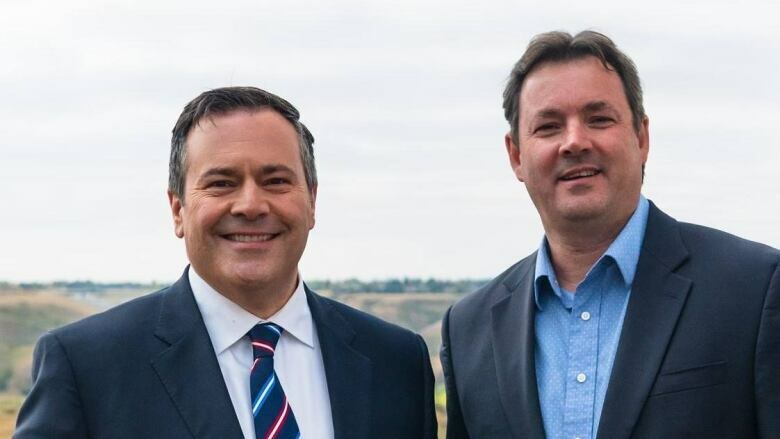 Callaway ran against Kenney, former Wildrose leader Brian Jean and Calgary lawyer Doug Schweitzer in August 2017, before abruptly dropping out of the race and announcing that he would throw his support behind Kenney in October 2017. Former UCP MLA Prab Gill, who resigned from the UCP caucus after an investigation into allegations of ballot stuffing, has requested an investigation into Callaway's campaign. He pointed to a YouTube recording that he alleges shows collusion between Kenney's campaign and Callaway's campaign, and listed multiple political donations that he found suspect, asking the commissioner to investigate. Both Kenney and Callaway have denied the allegations. Gill says the UCP has sent him a cease and desist order, calling his allegations "defamatory." Josephine Pon, the runner-up in the nomination contest, will now be the UCP candidate for the Calgary-Beddington riding. Another Calgary-Beddington candidate left the race on Wednesday. Alberta Party MLA Karen McPherson announced she will not seek re-election. She was elected under the NDP banner, but left the party in 2017 to sit as an independent, saying she was disappointed about the lack of transparency by the NDP regarding allegations of sexual misconduct against two unnamed party MLAs. She joined the Alberta Party later the same year.